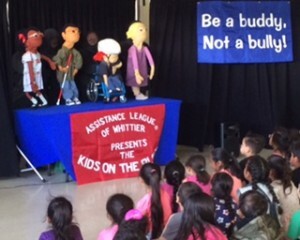 Kids on the Block is an interactive scripted puppet show started in 1981 and is performed by members using life-sized puppets to help children understand disabilities and social issues such as blindness, deafness, cerebral palsy, schoolyard bullies, or autism. Scripts for the internationally acclaimed educational puppet programs are written by experts in the field. The shows are performed free of charge by 12 talented puppeteers. Programs are selected by the schools. The 2016-2017 programs were “Drugs, Alcohol, and Smoking”, “Bullies and School Safety”, and Child Obesity. Members performed at 5 schools for children in grades K-6. The Kids on the Block also make numerous appearances at civic events such as the Whittier Holiday Parade, Whittier Community Health Faire, Whittier Run-Walk and Roll, and the Uptown Antiques Fair. 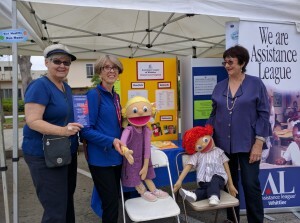 Assistance League of Whittier is an all-volunteer, nonprofit organization that puts caring and commitment into action through philanthropic programs in the greater Whittier area.